You must settle an argument between my spouse and I. He thinks this sandwich is “OK” and I think its fantastic. 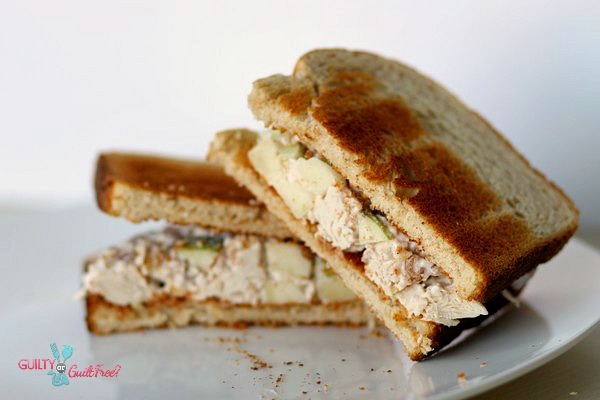 Light, nearly guilt free, and just the right amount of crunch to do a dance on your palette, I really enjoy a sandwich that isn’t just some sad turkey slapped on a bun every now and then. He told me that he had the impression based on the ingredients that it would be sweet. 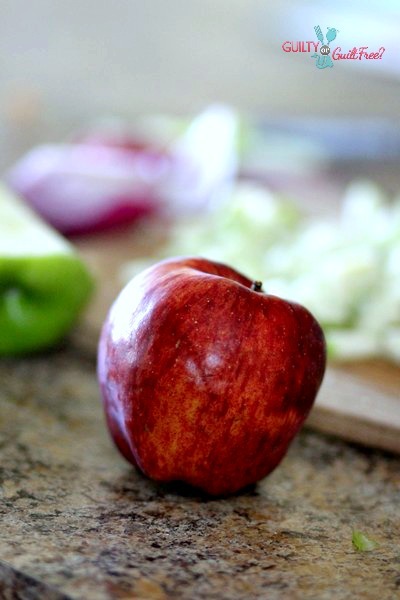 I suppose the green apple could fool you….. 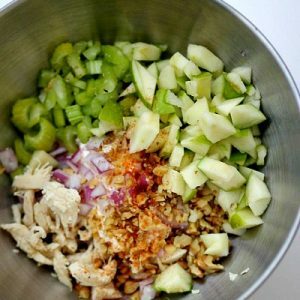 While a traditional Waldorf Salad is sweeter, and this recipe is absolutely inspired by the Waldorf ingredients, the chili and red onion give it more of a kick than a salivating sweet. 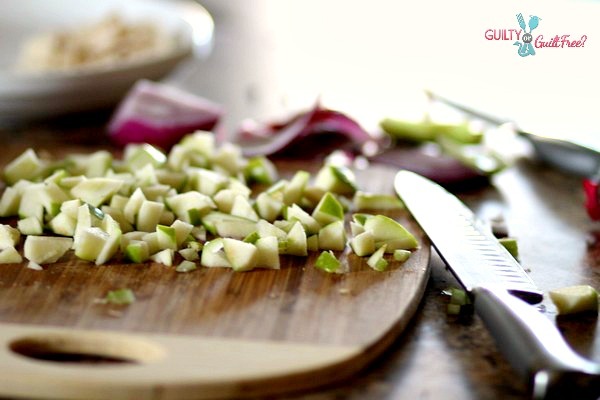 Both have their place in my kitchen for sure, but when I am prepping for dinner, I tend to shy away from anything that could also be considered a dessert or side dish. In any case, I personally loved it…. (and fully planned to have some more today but left it out on the counter overnight and the fruit flies attacked!) 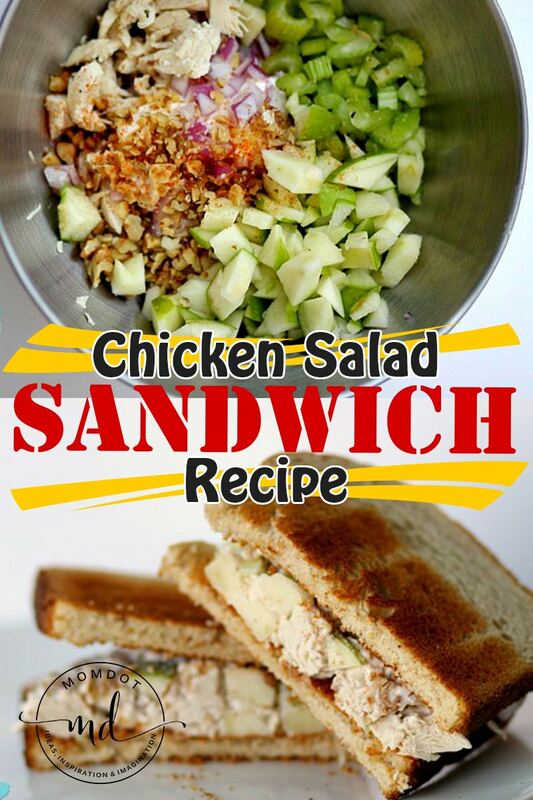 and want to know what you think…..
Btw, what is your favorite sandwich to eat? I would love to know! 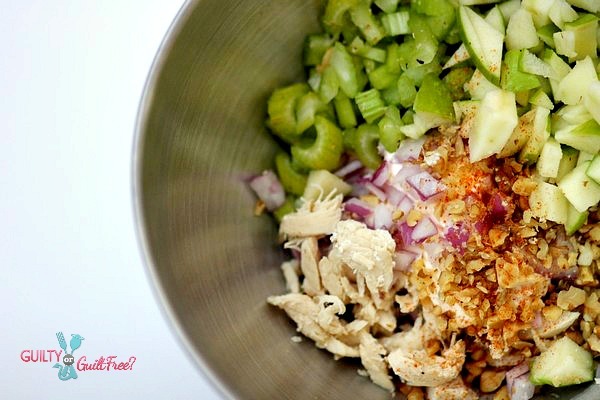 Poach your chicken in 3 cups of water on the stove. I personally use chicken strips to make it easier. Once done, cool and cut up in bite sized pieces. Toast your walnuts on medium heat for about 3 minutes, constantly moving them. Remove from skillet. 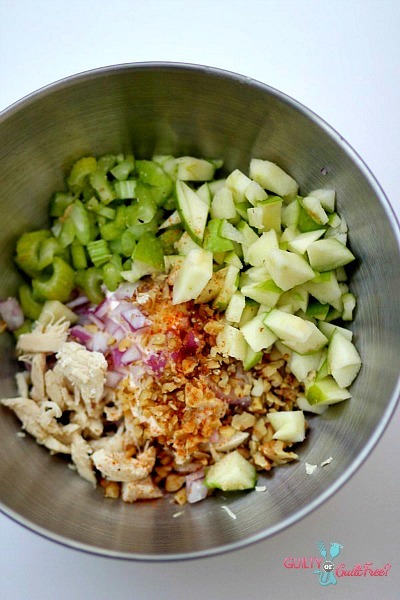 Slice up your onions, apples, celery and toss in a bowl with your chicken and walnuts. Add 1/4 tsp chili powder. You can add more to taste if you like, but be careful not to go overboard. Feel free to substitute with Curry instead. Combine together with 1 cup of Mayo. I use Hellmans and refuse to use anything else. For a healthier option, you can use plain Greek yogurt. 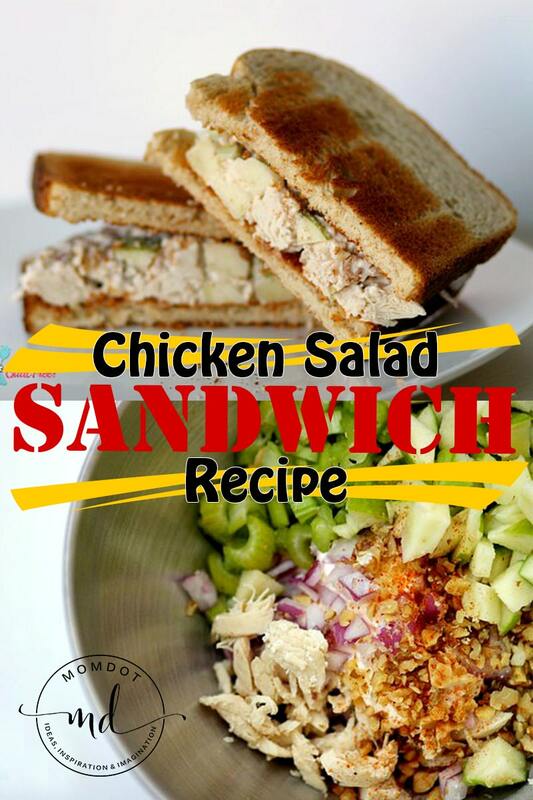 Toast your favorite bread and add your chicken salad to it. We used Sourdough. 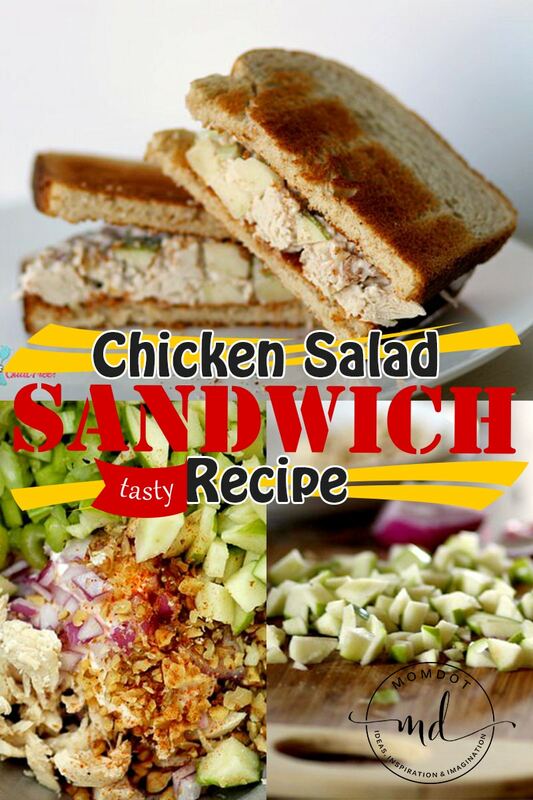 I personally like my chicken salad a little more on the creamy side, so I add Mayo to taste. Remember just a spoonful extra at a time till you get your favorite consistency. You can add...but taking back is a whole other story!